New favorite vegetable: grilled, marinated zucchini. It is because of this recipe, that my sons fell in love with zucchini. Francesco was a tad bit envious the other day, when I snagged some of these zucchini from the fridge, piled them on a plate and topped them with a poached egg... he even went so far as to sneak a few bites. Every time they add a vegetable to their repertoire, it gives me some imaginary notch on my motherly belt. Something about it feels like: mission accomplished. Like I finally figured out a way to prepare 'this particular vegetable' in a way that makes them love it. Return to it. Ask for it. Happy to see it. What? Oh, other vegetables that I make-in-a-certain-special-way, so now my boys love it? But back to the zucchini. I make this all the time now. 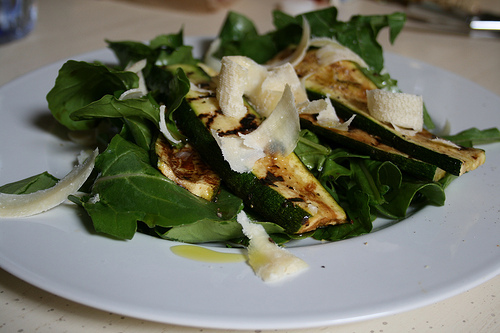 Thinly slice (I aim for 1/4 inch slices) the zucchini; brush olive oil on each side and grill. Mix the marinade, pile the zucchini into a bowl and pour the marinade on top. A bit of pooling in the bottom is fine: for me, that later becomes the 'salad dressing' when I use a few slices and dump them on a bed of arugula. Add some shaved Parmesan and perhaps some toasted pine nuts and you have: lunch. Blend, and pour over 2-3 [sliced and grilled] zucchini.